Obviously no schedule is ever actually perfect with kids... because that would be boring... but I am pretty much IN HEAVEN that it is summer vacation and I am really really excited about how we plan to spend our summer days over the next month or two. When I talk about "perfect" in this post I just mean it using this definition, "having all the required or desirable elements, qualities, or characteristics; as good as it is possible to be." I don't mean picturesque or free from fault or defects. 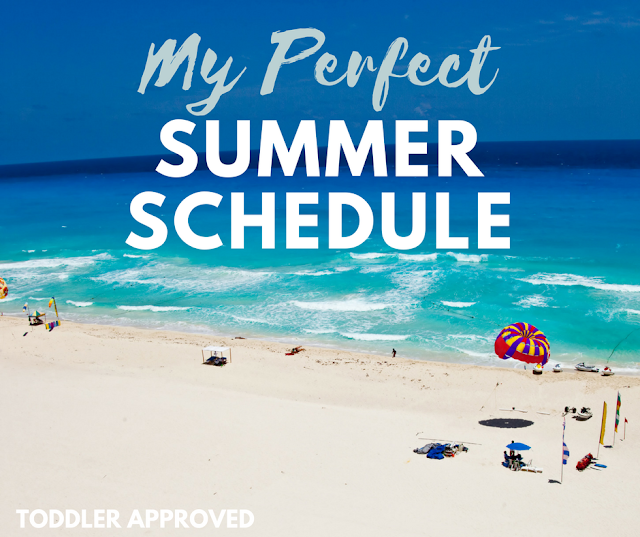 Today I'm sharing what I think makes for a perfect summer schedule for me. 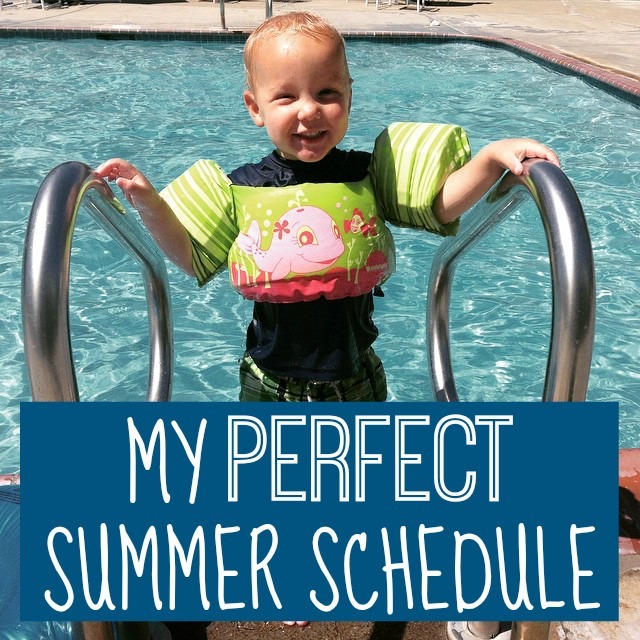 I'd love to hear your perfect summer schedule too... since I'm sure it will be different than mine! We kicked off summer last Thursday with a family pizza and popsicle party, bouncing on our bouncy house, and some simple water play. My goal for this summer is to "connect and create"! 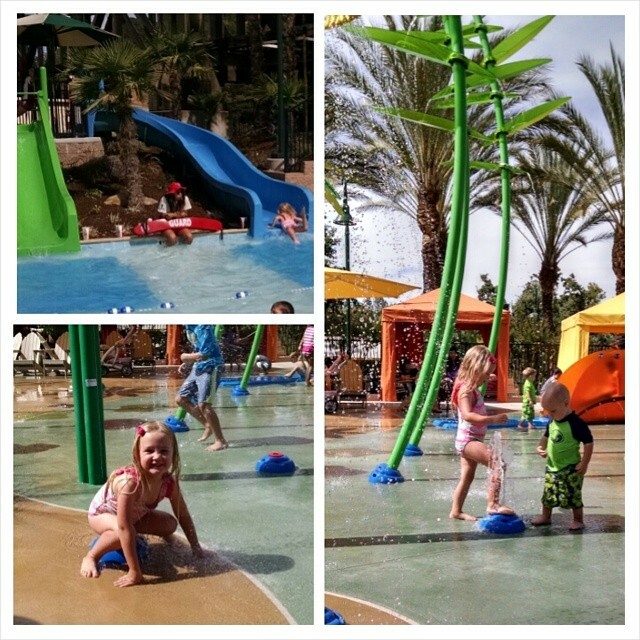 We like to connect through family excursions and active adventures along with creating together! We are keeping our summer really low key and simple this year. During previous years I have overscheduled us with camps and swimming lessons and gymnastics so much that I didn't feel like summer was a break for anyone and we didn't go back to school recharged! This year I am changing that a bit. All three of my kiddos ages 7,4,2 are IN LOVE with My Little Ponies right now... so it is adorable watching them watch it together and sing along... I catch up on work a little bit while they watch a quick show. We like to get out and get active earlier in the morning before it gets hot! 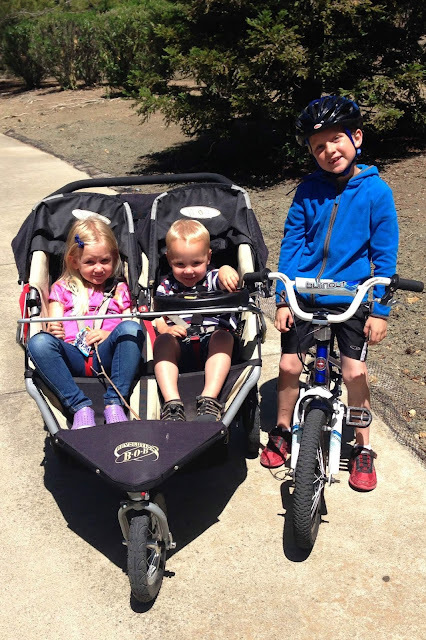 If I don't run before the kids wake up then we all go on a bike ride/jog together or a hike. My oldest (7) rides his bike along in front of me while I push my younger kiddos (ages 4 & 2) in the jogging stroller. It is tough workout for me pushing them! We jog/ride about 2 miles to a park, play for 20 minutes, then jog home. I feel amazing because I got a workout in and the kids get some energy out and have fun seeing friends (or making new friends) at the park. We either hit up our neighborhood pool after our workout or do simple water play in the backyard. My kids especially love to just spray each other and all of our plants with spray bottles. They also love doing some fishing for balls in our water tub. 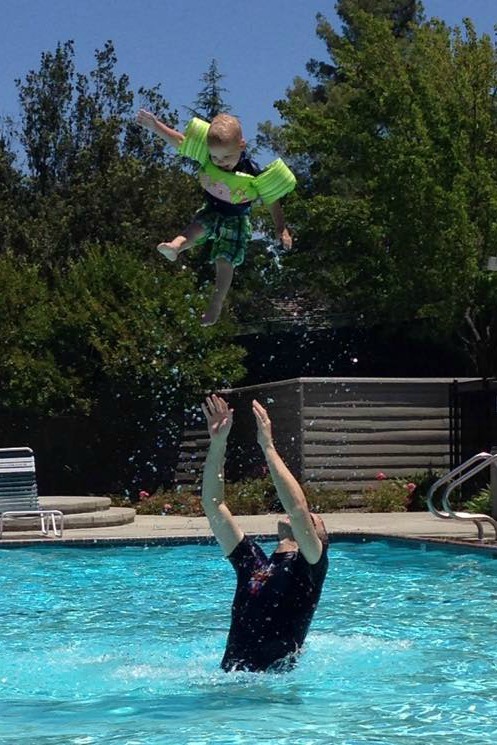 My kids are especially excited when my husband can join us at the pool on the weekends since he likes to play a bit more crazy than I do (see photo above)! Around one or one thirty we come home and all the kids have some downtime. My older two kids go to quiet time in their rooms while my two year old naps. Somedays the two year old just plays and reads books in his crib instead of sleeping, but most days he naps since he is so exhausted after all of our morning activity! In the late afternoons we do one or two simple Virtual Book Club Summer Camp activities depending on the theme of the week and we also play a lot of games. Sometimes we will wander the neighborhood and go on a spider hunt or we'll just go on some sort of adventure or to a new park. Lately all three of my kids having really been loving playing games. Even my two year old will join in and either be on someone's team or try playing all by himself. 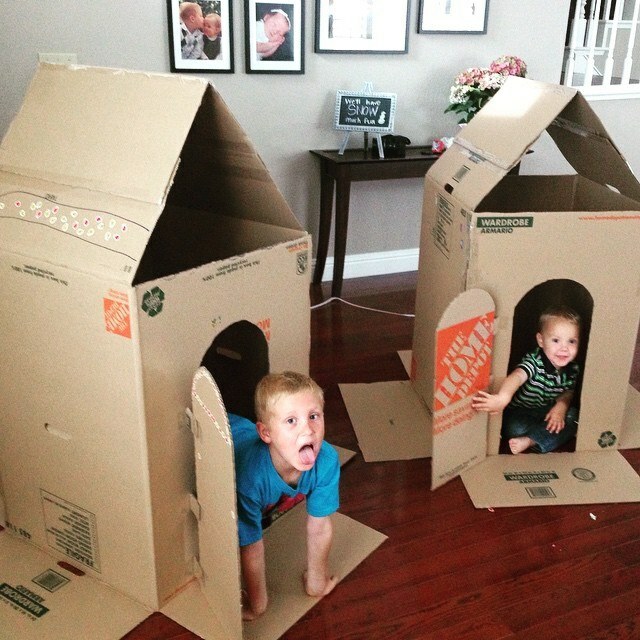 During our creative time we also do simple things like making cardboard box houses. The kids have been decorating these with stickers and other things for almost a week now! Since this week our Virtual Book Club for Kids Summer Camp has a Construction Zone theme we have also been doing some simple construction themed activities with our CAT trucks we bought a few weeks ago and reading some simple construction books. Goodnight Goodnight Construction Site by Sherry Duskey Rinker is our favorite so far. While I make dinner our kids will play in our backyard on our bounce house or play soccer or watch another few minutes of a show on Netflix. We have more lax rules about shows during the summer! Since dinner time doesn't seem as rushed as it does in the school year we have been working on our manners and conversational skills and having it last longer. We play a question game and we also practice putting napkins on our laps and learning where the silverware goes. My two year old has been loving helping me set the table for dinner lately too and then all kids get to clear their plates once we are done. We have been trying to clean rooms every night during the summer so that each new day we start fresh with a clean house. We turn on some music and have fun (most of the time). I get laundry put away while the kids work on their rooms. Sometimes they play for awhile instead of cleaning... but eventually things all get cleaned up! My two year old loves to jump in my laundry piles and help me sort! I feel like our summer days have just been flying by as we've implemented this simple relaxing schedule. I was worried that we wouldn't have enough to do, but we've found plenty! We also invite friends over for playdates or meet up with friends to go on excursions. I love summer! I didn't sign my kids up for any camps this summer (yet) but we have planned ONE special excursion for each week instead of spending money on camp. We'll head to a local amusement park/water park, go on a train ride, beach day, take a trip into San Francisco, etc. Our weekly excursion will be a full day trip! 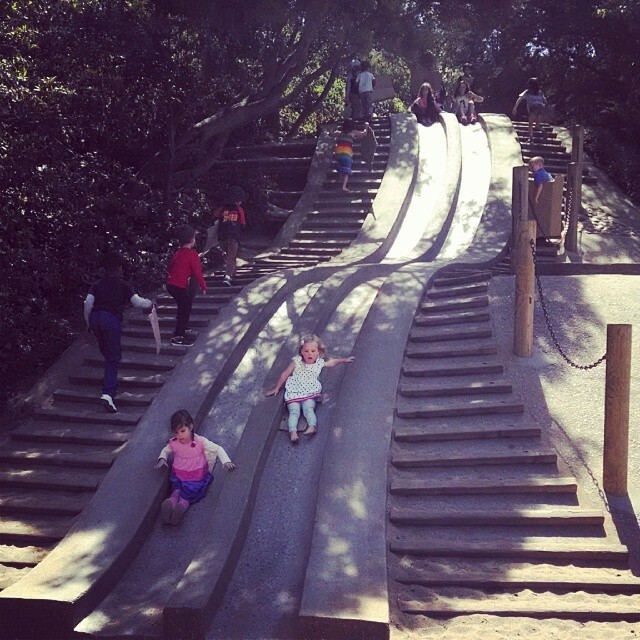 We love exploring "new to us" places around the SF Bay area or just revisiting old favorites. Our list of places for us to go keeps growing so I am excited to see what we end up deciding to do each week! My oldest two kids are also going to do swimming lessons at some point and my 7-year-old is starting piano lessons! He is so excited. All activities are in close proximity to our house though so that we can walk and not spend tons of time driving in the car. Hooray! Alright, so now that I have shared my perfect summer schedule with you, I'd love to hear about yours!! What is your favorite way to spend the summer? Do you like things busy or low key? Do you have tons of vacations planned or are you sticking close to home? We definitely have several out of town trips planned for this summer, but for the next several weeks we are home and relishing this simple slow schedule! 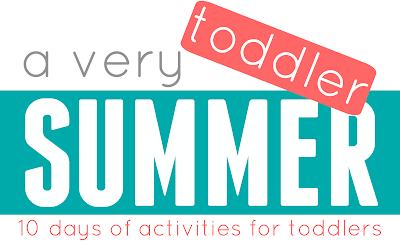 Need some fun summer ideas? Check out our "A Very Toddler Summer series" and our Virtual Book Club Summer Camp. Awesome! You are amazing and inspiring! 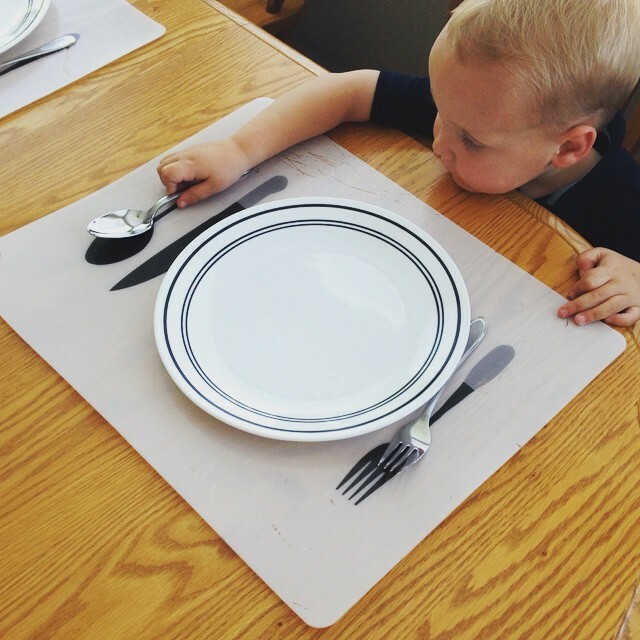 Quick question: Where did you get your table setting placemats? Target a few years ago. I need a new set since our family has grown since I bought them! I love this schedule! Thank you for posting. 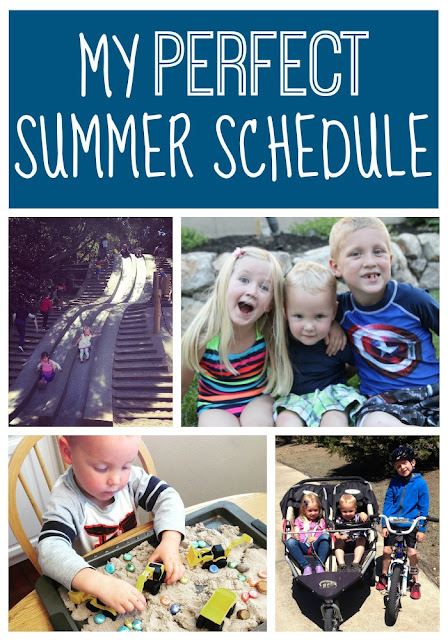 I have an almost 3 yo and a 1yo and have created a similar relaxed summer schedule. I have a question. When do you get things done such as grocery shopping, errands run (Target, post office, etc) without it eating into your summer schedule? I stay home full time so your reply will really help me as I continue to try and balance quality time with my kids and errands that need to be run but five my kids into car seats, shopping carts, and strollers more than I would like. Thanks in advance!